Injury prevention and performance training systems supported by the latest research. Learn how to identify poor movement patterns and how to implement corrective exercises to help you climb strong and injury free. The tendons in your fingers are anchored down by pulleys that keep the tendons gliding flush to the bones. Excessive strain on the finger can exerts an outward force on the pulley which may strain or tear it. The tendons in the shoulder slide through a very narrow passageway and attach to the shoulder bone. Impingement occurs when the space in this passageway is reduced from bad movement. Poor belaying postures repeated can lead to belayer's neck. Avoid tilting your neck back, slumping your spine and rounding your shoulders. Keep your head, neck and shoulders within a plumb-line. Tennis elbow occurs on the outside of the elbow. The constant activation of the muscle on the back of the wrist that attach to the elbow can tear the tendon. The muscles that flex the wrist share a common tendon on the inside of the forearm. Constantly flexing your fingers and wrist while climbing can degenerate the tendon as it inserts into the bone. Over time, the biceps muscles overdevelop from climbing and the opposing triceps muscles become weak. This imbalance can lead to overuse and micro-tears in the triceps muscle group. The shoulder is made up of four rotator cuff muscles. These muscles connect the shoulder blade to the arm bone. The rotator cuff muscles act together as a unit to control shoulder motion. You need to strengthen the rotator cuff to prevent muscle strain. The finger joints are supported on each side by collateral ligaments. When you climb, your fingers are placed in aggressive positions that increase the force into the ligaments. A dynamic climbing warm-up demonstrated by professional climber Jonathan Siegrist. 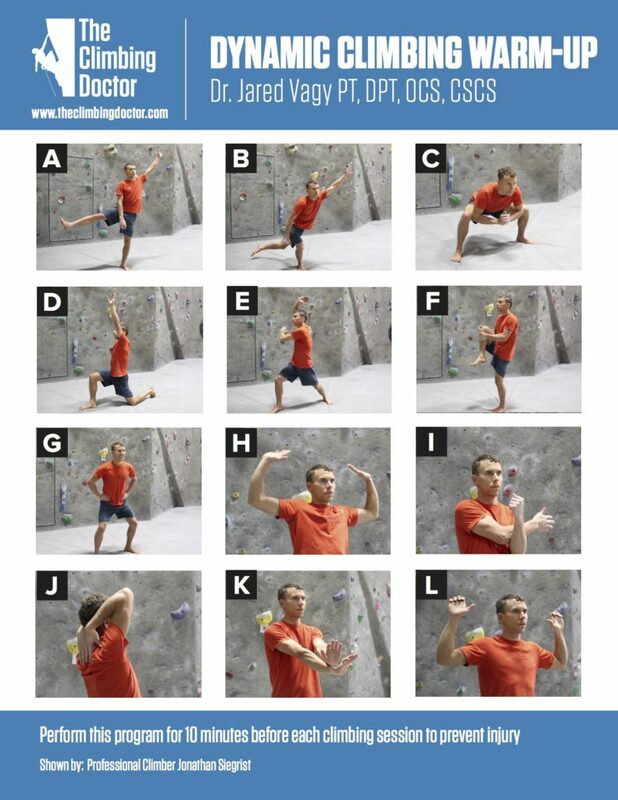 The warm-up is broken down into four sections: On the wall, rotation, arms and wrist and fingers. The video will take you through the step by step process of each movement.